If you work in the software industry, I am sure that you have heard people using the word “ecosystem”. A good example of an ecosystem is that of Microsoft that spans globally and has more than 500k partners of different types and with different focus. If you want to focus on Microsoft ecosystem, you have to divide it into sub-ecosystems as each of them have their own nuances. 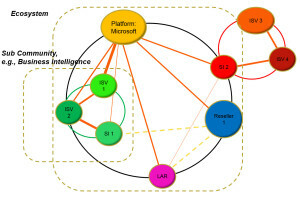 The included picture shows how a large Microsoft ecosystem can be divided into sub-ecosystems and in this case a sub-community could be for example business intelligence professionals that work with Microsoft technology in different roles. The community is built based on interest and maybe having a specific solution that fits into the sub-ecosystem or community. My personal interest areas within Microsoft ecosystem is anything that has to do with collaboration solutions such as SharePoint. Another area of my interest is Microsoft Dynamics ecosystem, which represents both solutions in enterprise resource planning as well as customer relationship management. I have put huge amount of time in learning about solutions that are built on top of SharePoint and Dynamics CRM. Many new software vendors are building solutions that run natively in Office 365 environment such as award-winning Gradient that has built a native SharePoint scanning solution that works in Office 365. This solution (GScan Online) is a good example of new generation of solutions that you will see “popping up” in ecosystems such as Microsoft SharePoint. A common mistake that I see many software vendors do is to not do their homework and really understand how an ecosystem works and understand the players within it. Software vendors typically skip the validation phase when setting their business model, assuming that the solution will be well perceived by the ecosystem. Another common mistake is to not understand the competition. If there is competition, the software vendor has to understand how to position the solution so it won’t be “yet another of these”. Business intelligence is a good example of this. There are tens of different business intelligence vendors in Microsoft Dynamics ecosystem and when you try to differentiate them, they all use the same slogans and terms. How are the end users going to be able to differentiate what the differences are? I was able to see this myself in the latest Microsoft Convergence 2014 event in Atlanta. It was interesting to see and talk to vendors and see how the vendors positioned themselves. I am a true believer in competition but I am also a true believer in differentiation in the same way as you segment your market with your solution. When I run business modeling workshops, most of the focus is always on the value proposition and market segmentation. If you get them wrong, it really does not matter what you do as you will not reach the right audience and you will probably also fail building your solution to be appealing and valued by your customers.